This is not a political event, but it may be of interest to those of you who have something to promote online, whether it’s a campaign or a business. RSVPMaker lets you manage events on your own WordPress website. How do you get people to come to your website and RSVP? Although social media promotion is important — and the strong support you get for search and social is one of the main reasons to use WordPress as a foundation for promoting your events — a good email list of customers and fans is also invaluable. One of the strongest online services for sending marketing email of any sort is MailChimp. RSVPMaker’s new, improved MailChimp integration makes it the ideal way to send invitations to events you’re promoting through your WordPress website. I’ve also been using the MailChimp / RSVPMaker combination for years now to send automated weekly calendar of events roundups to the members of a couple of different online communities. The techniques I’ve used for that process are now coming to RSVPMaker as standard features. In this webinar, conducted via Google Hangouts on Air (which RSVPMaker also explicitly supports), I will walk through the possibilities, answer questions and get your feedback on what you would like to see improved in RSVPMaker. Sign up below to get the details. Is Someone Pretending To Be You On Facebook? Today I got a Facebook friend request from Joanne Sterner — except it wasn’t really Joanne Sterner. Joanne is a great Democrat, so I almost clicked “Confirm” before stopping to think that we were probably already Facebook friends. One clue was that fake “Joanne” and I only had 2 mutual friends. When I looked up the real Joanne, I saw that we had dozens of Facebook friends in common. Another clue that a profile might be a fake is that the posts associated with the profile only go back a few weeks, and you know the person has been on Facebook for years. Facebook search will let you look up the real person’s profile so you can see the contrast. This has happened to so many friends lately, inside and outside of politics, that I thought it was worth sharing some tips. If it happens to you, in most cases it doesn’t mean you’ve been “hacked” in the sense that someone has your password and can access all your private information. Rather, your profile has been “clone” by someone who took your profile picture and other publicly available information and used it to create a fake profile in your name. Your best defense is a network of good friends who will be suspicious enough to alert you to the problem before it gets to that point. This is the page where you actually report an impostor. Here is another article that contains some useful tips on identifying fake accounts. Facebook is a great resource for promoting the Democratic cause, but unfortunately it can be like campaigning in a bad neighborhood sometimes. You need to be prepared for the eventuality that things will go wrong. I will probably announce this in a bigger way later in the week, after a little more shakedown testing, but BlueBroward.org has just gotten a technical overhaul. It now runs on the WordPress blogging platform, but with my customizations layered on top. As I said, I’m still testing it out, so let me know if you run into something that doesn’t work properly. Recently, I’ve been exploring the tools Facebook provides for posting notes and links to only a subset of the people I’m connected with on the service. I knew there was supposed to be a way to do it, but it took me a while to figure out how — even as a supposedly tech-savvy guy. So I thought others might find this useful. The secret identity I’m trying to protect is not so secret to BlueBroward people: my identity as a partisan Democrat. And it’s not much of a secret from anyone motivated to do a minor amount of digging or backgrounding on me. Still, there are old high school friends and former colleagues I have reconnected through Facebook who might not care for my politics, not to mention potential employers and potential customers for my consulting business whose politics I don’t know and who I don’t necessarily want to know mine. Or, at least, I don’t need to go out of my way to be “in their face” with my political views. To some extent, I’ve told professional contacts that I stick to “just business” topics on LinkedIn, and they shouldn’t connect with me on Facebook if they don’t want to hear about my politics. But it’s hard to set rigid boundaries. Also, some of the local political issues that I write about on Facebook are pretty irrelevant to writers, editors, and tech people I know in New York and California. I can either choose an existing group or type in the name of a new group I want to create. These groups are just labels for types of Facebook friends within my larger contact list. — and then categorizing individual contacts. Now, when posting a status update or link, I can click on the lock icon to get options for restricting the item’s distribution. I then select “Customize” off the list. At this point, I could type in a list of people’s names. But what I’m going to do instead is use the group keyword for my political friends. Notice that I could make this my default setting. But no, there are plenty of other links I share that are not political. And sometimes I may want to share a political point even with those who might not agree with me (I just want to be able to pick my battles). Once I click “Save Settings,” I am returned to my home screen, where I can post this my message by clicking the “Share” button. But now, instead of being shared with everyone, the item should only be displayed to the people on my “political” list. 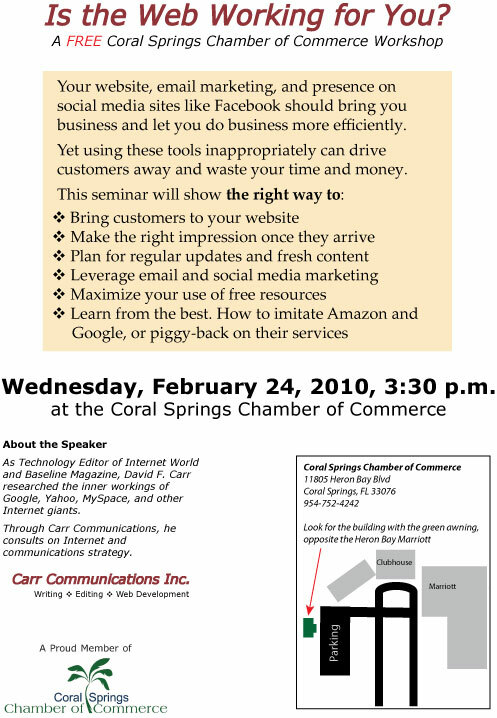 I invite you to join me for this free workshop I will be presenting through the Coral Springs Chamber of Commerce on Wednesday, February 24 at 3:30 p.m.
I’ve given a slightly different version of this talk to some political audiences, but really the principles are the same for a campaign as they are for a business. You need to think carefully about how to present the right impression online, through your website, Facebook profile, and email broadcasts. I draw on both my personal experience as a webmaster and consultant, as well as my reporting for Internet World, Baseline Magazine, and most recently Forbes.com. Update: Will also share some great tips I picked up at this week’s WordCamp Miami conference for WordPress enthusiasts. I’m a fan of WordPress as a content publishing tool that can be part of an affordable, effective solution for small businesses, non-profits, and political campaigns. I think we all need a laugh at the expense of our politicians about now. Former Surgeon General C. Everett Koop warns, "The Capitol Steps will cause your sides to split!" Don’t miss the insightful, irreverent and always amusing humor of Capitol Steps, the talented band of former Senate staffers who satirize the people and places that employed them. Known for their hilarious musical skits of Capitol Hill personalities and current events, their 27 albums and sold out shows keep audiences on both sides of the aisles laughing out loud. They put the MOCK in democracy, and are even funnier than Congress! You’ve seen and heard them on NPR, NBC, PBS, and ABC. Now see them live! I’m cross posting this from my carrcommunications.com blog because I’ve now run across the problem of campaigns failing to control their own Internet domains several times. Your domain is an important asset that you need to protect for the success of your campaign and (hopefully) future reelection campaigns. One thing that many small businesses, nonprofits, and political campaigns I have dealt with fail to pay attention to is ensuring that they have direct control over the Internet domain associated with their website and email accounts. Often, the domain is registered by a web consultant in the name of the consultant or consulting firm. Or sometimes, with nonprofits, it’s a volunteer who handles the registration and who winds up with the domain in his or her name. Unfortunately, this can cause the organization that rightfully should own that domain a lot of grief if the intermediary turns out to be unreliable, incompetent, dishonest, or just unreachable at a critical moment. This is where your website and business email both go dead one day, seemingly without warning, because you never got the notices that your registration was about to expire. Or, you hire someone else to revamp your website, only to discover that you can’t “turn on” the new and improved version because you don’t have the necessary password and aren’t recognized by the domain registrar as having the right to access the account. Read on for more about how to avoid problems with your domain registration. This is only one aspect of a campaign’s online identity, of course. You also need to protect your website, pages on Facebook and similar sites, and your email account, so that no one who is not you (or an authorized proxy) gets to put out messages that look like they’re coming from you. Think offensive messages, swastikas on the home page. Even after you explain that your site was hacked and it wasn’t really you, you still wind up looking foolish. Among other things, this means you need to use serious, hard-to-guess passwords for your campaign accounts. Why would you, as a candidate, not consider the possibility of someone hacking your site as a political dirty trick? Even if your opponent wouldn’t stoop that low, you could be the victim of a rogue volunteer who is able to log into your website or your Facebook page or your email account because you used an obvious password like “grassroots” or the name of your first born child. Even outside of the political context, I see evidence of people trying to hack my websites all the time. Bored high school kids download automated hacking tools off the web and set them to probing Internet sites at random, breaking in just for the hell of it wherever they find weakness. So this is an area where it pays to be paranoid because they really are out to get you. You have to balance the need for security against what you can realistically memorize. Just don’t make it so obvious that your accounts can be cracked by anyone who has seen you talk and can try plugging a few of your favorite words and phrases into that password blank. Because some of the old posts are fairly outdated now, I thought I should highlight a few that I believe are still relevant in terms of strategy for exploiting the Internet. Interesting Christian Science Monitor piece on the hazards of email miscommunication. Not specific to politics, but something to keep in mind for every kind of email interaction.